Torontoist sent four writers and one photographer to wander the city for this year's edition of NXNE. Here's what they learned. We Were Lovers at The Boat. Amos the Transparent at the El Mocambo. The Black Belles at the Garrison. The Men wreck shop at The Garrison. No Use for a Name at Yonge-Dundas Square. This man's picture appears in the dictionary next to the word "stoked." Portugal. The Man play Yonge-Dundas square. A very enthusiastic Flaming Lips fan at Yonge-Dundas Square. Flaming Lips fans at Yonge-Dundas Square. Killer Mike is really happy to be here. A rapt crowd watches Killer Mike at Yonge-Dundas Square. Ghostface Killah at Yonge-Dundas Square. Wu-Tang fans throw their "W's" up at Yonge-Dundas Square. Wu-Tang fans throw their “W’s” up at Yonge-Dundas Square. As we shake off our hangovers and readjust to the rhythms of normal life, let’s take a minute to look at what we learned over the course of this year’s edition of North by Northeast. Sometimes buzz bands do live up to expectations. Too often, we’ve seen get a sudden rush of Internet-fuelled fame overwhelm artists, leading them to collapse under the pressure. (Lana Del Ray, we’re looking at you.) At NXNE, with a couple of exceptions, that didn’t really happen. Blog-buzz acts like DZ Deathrays, The Men, and Purity Ring all came through in the clutch. It’s good to know that sometimes you actually can believe the hype. Punk rock has been declared “dead” repeatedly over the last three decades. This year’s edition of NXNE proved that rumours of the genre’s demise have been greatly exaggerated. In fact, with acts like Teenanger and Ceremony picking up the mantle, it may have a brighter future than it’s had in a while. Some venues may just be in it for the late license. It seemed as if a few North by Northeast venues were less interested in hosting bands and more interested in being allowed to pack in customers and serve alcohol until 4 a.m. At least one artist called a venue out for allowing a very loud dance party to go on upstairs while he was performing in the partially open basement, forcing him to compete with the DJ. Let’s hope they straighten this out for next year. Hip-hop is not a threat. NXNE got off to a bad start for the hip-hop community. Wednesday night’s SmashMouth entertainment showcase at the Rivoli met a sudden and inglorious end after a visit from the Toronto Police Service’s Guns and Gangs Unit convinced the venue’s management to pull the plug on the show. That said, the genre bounced back with a vengeance throughout the rest of the week, with acts like Killer Mike giving barnburner performances, and ending with nearly 10,000 hip-hop heads pressing together like sardines to watch two of the genre’s living legends, Raekwon and Ghostface Killah, throw down at Yonge-Dundas Square. Not only did the event go off without incident, but, according to our photographer (who went to all the Yonge-Dundas concerts), the crowd for Sunday night’s hip-hop event was better behaved than the audience at the other three shows. This is a funny town. 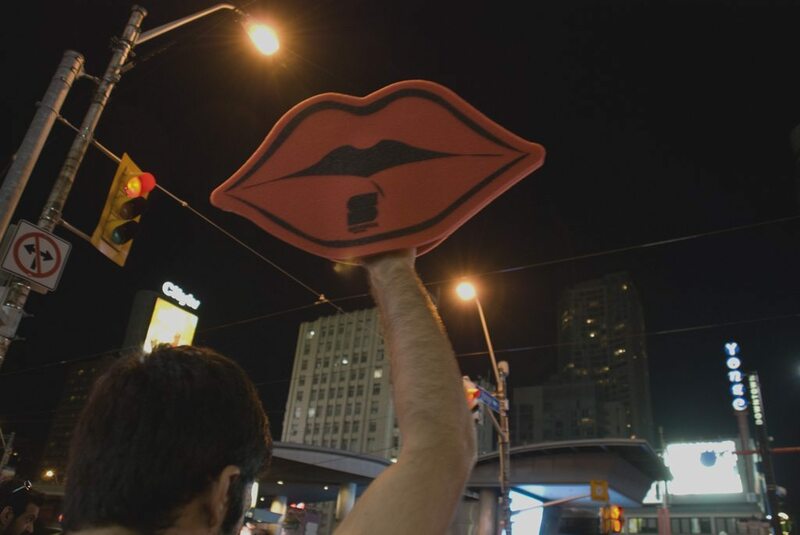 While this wasn’t the first year that comedy was included in NXNE, it was the year that the festival’s comedy content reached a critical mass, and by almost every measure, audiences were loving the laughs. From the nightly Comedy Records showcases at LOT 100 to the more risqué Strip Comedy and Raw & Hard shows at the Monarch Tavern, a largely local cast of comics provided a great change of pace after a night of bands. Toronto is a fun city. Whether or not it’s totally accurate, Toronto has a reputation as a city that has trouble enjoying itself. NXNE is proof positive that the town can give any other city on the continent a run for its money in terms of good times. Free concerts and late last calls aside, there’s a spirit of spontaneity that takes over for the festival. People dance to bands they’ve never heard before, throw last minute parties and shows, and occasionally hug passersby. On multiple occasions throughout the weekend, we walked into a stranger’s yard, opened a beer and watched a band play. It would be great if the city could have just a little of that NXNE spirit throughout the year.